45 x 60mm on 120 film, the first Japanese folding camera to be exported after WWII. 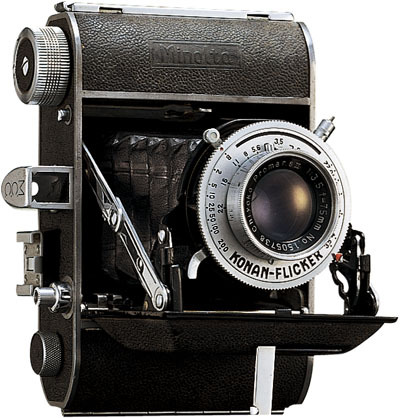 First appearance of the Rokkor lens brand name on the 70th Anniversary poster – previous models generally have ‘Promar’ Anastigmats, or Chiyoda Kogaku (Chiyoko) labelled lenses. 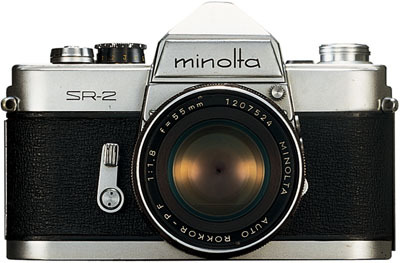 Minolta’s first 35mm FP shutter camera with coupled rangefinder and self-timer. The 35 used the standard Leica M39 mount, but had a frame size of either 24 x 30mm or 24 x 32mm depending on the exact date and model, instead of 24 x 36mm. Editor’s note: At Icon, we have owned and used one of these for a few years. Ours was 24 x 32mm and took 42 frames per roll. 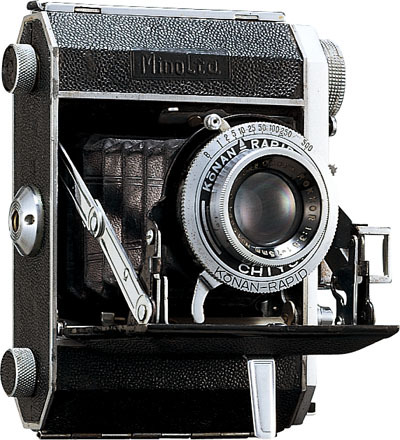 It was fitted with an undocumented Minolta ‘first’, a flash synchronisation through the accessory shoe which proved to be compatible with modern hot shoe flashguns; it was probably a Model A. The lenses have copyright symbol before the Super Rokkor name, which is infilled with blue (not clearly visible). This © symbol actually means ‘Coated’, not copyright. First 35mm leaf-shutter camera with lever-wind film advance to be manufactured in Japan. Editor’s comment: this is surely one of the finest pieces of industrial design of this era, matching the later Purma and Ilford Advocate in looking forward while retaining traditional components. Subminiature camera taking 16mm movie film, push-pull advance. 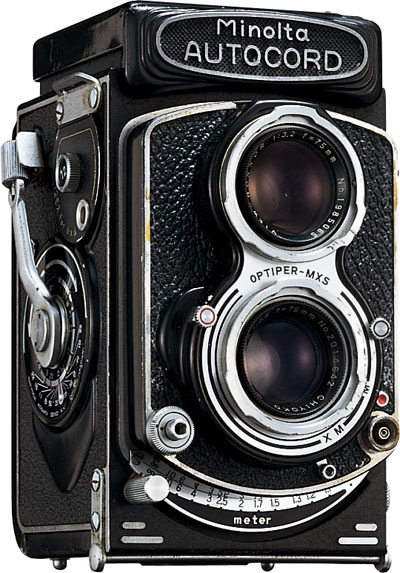 45 x 60mm on 120 film, compact camera with rangefinder and flash synchronisation terminal (this is not a Compur-PC sync socket as used today – it is the unusual item sticking out at about 2 o’clock as you view the lens. 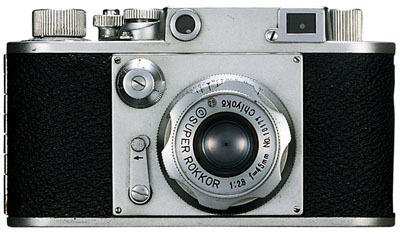 Note the reversion here to using the older Promar lens name with the Chiyoko origin, and the use of the Konan name for the shutter in place of Crown). 60 x 60mm on 120 film, with instant open-and-shut finder hood and magnifier (lens is now named Rokkor again). 60 x 60mm on 120 film, with crank winding and lever helicoid focusing. 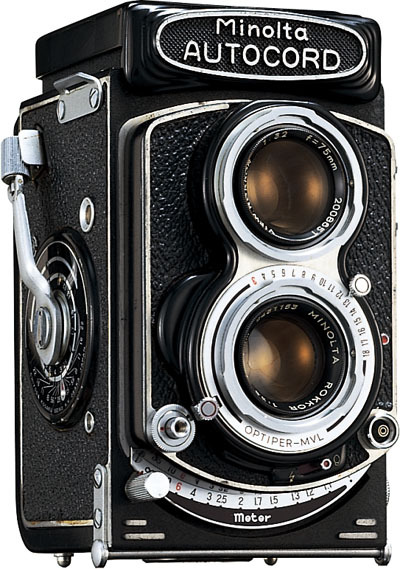 Editor’s note: although named ‘Cord’, the Rolleicord used knob winding, and the Rolleiflex used lever crank winding. 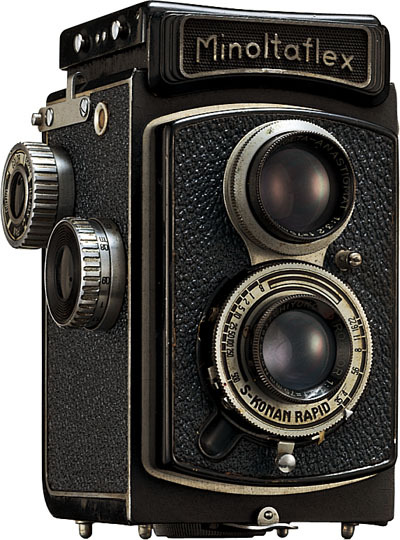 Minolta used a rapid crank from the very first ‘Cord’ model so their naming did not reflect copying the Rolleicord. The lever helicoid focusing below the lens assembly was retained permanently as a unique and very rapid feature of the Minolta TLRs. Sadly, it also spelled their demise, as it was non-availability of the focusing lever and assembly which finally prevented Minolta from servicing and repairing Autocords in the early 1990s. Promar lens again! The Prontor-Compur type (PC) synch socket is for flash Bulbs only, not electronic – type M synchronization. 60 x 60mm on 120 film, X-synchronization introduced. Editor’s note: from this model onwards, Autocords are fully usable with modern colour films and can produce exhibition-quality results, if in good condition. 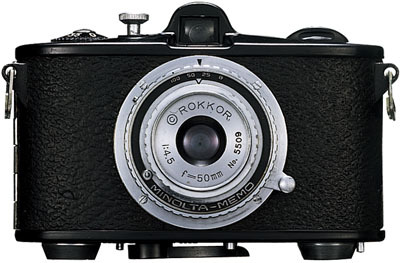 Note the superior lens coating, the use of ‘Rokkor’ and the Minolta name before the ‘Rokkor’ name rather than ‘Chiyoko’ which appears on the earliest Autocords. We believe this photograph shows a 1960s Autocord, not a 1955 model, because of these clues. The lever next to the PC flash socket moves between a lightning symbol (X, or electronic flash) and bulb symbol (M – if accidentally set to this, electronic flash will not coincide with the shutter opening and images will be unexposed or underexposed). 35mm leaf-shutter camera with bright frame viewfinder. 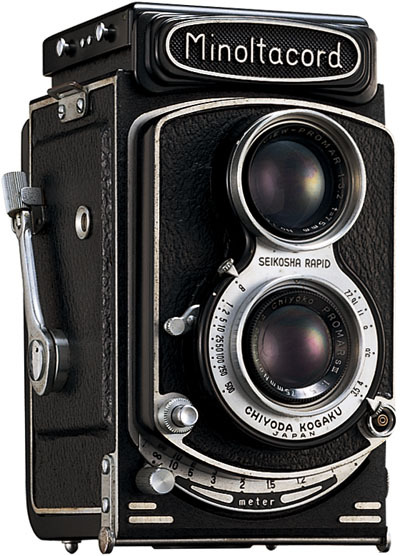 35mm leaf-shutter camera with interchangeable lenses, rangefinder, accessory selenium meter which couples to the shutter speed dial. Editor’s note: although this camera looks like a Leica M-series, it is of course a leaf-shutter model with a Seikosha MX shutter fitted in the rear section of the lens unit. The next year, Minolta showed a prototype more modern in looks than this at the Brussels Exhibition, of a focal plane rangefinder using the Leica M mount. This camera never went on sale and surviving prototypes are extremely valuable. E. Leitz GmbH took action to prevent the use of their mount by Minolta, who had also been closely copying the inside workings of Leica cameras – specifically, the ‘concentric’ design of the focal plane shutter set round the shutter release spindle. It seems to have been the 1958 exhibition which sowed the seeds of later co-operation between Leitz and Minolta, probably because Minolta agreed not to market a Leica M clone, and because Leitz were suitably impressed by the quality of this clone. 60 x 60mm, 40 x 40mm or 40 x 50mm on 120 film – model with interchangeable format masks. Note ‘Chiyoko’ Rokkor lens (see comments on 1955 Autocord above). 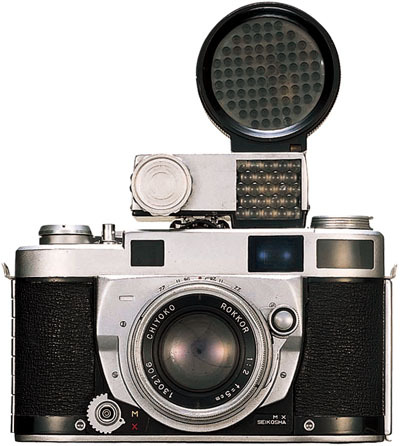 The world’s first 35mm leaf-shutter camera with a built-in, coupled, CdS exposure meter. 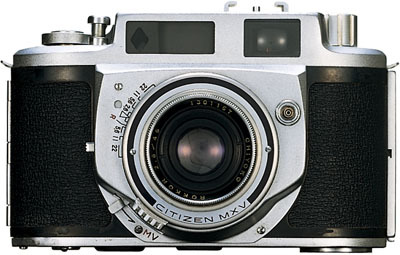 It uses a 35mm f/2.8 lens in place of the more common 45mm or 50mm length found on such cameras at this date. The world’s first 35mm leaf-shutter camera with a shutter speeded to 1/2,000th of a second. The final incarnation of the screw-Leica mount Minolta rangefinder series. 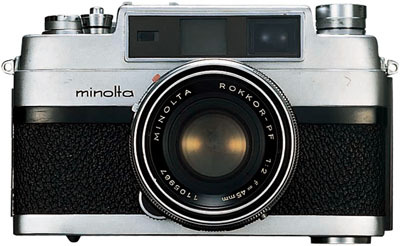 Minolta’s first 35mm SLR system camera. Editor’s note: this was another Brussels exhibition launch. The SR mount was closely modelled on the Leica M mount, before Leitz had introduced their own R-mount for reflex cameras. 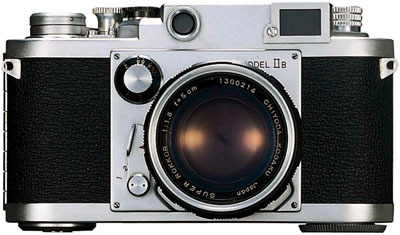 The shutter mechanism and many aspects of the body design are also modelled on Leica engineering. In particular, the focal plane shutter uses the same principle as the Leica M shutters, where the actuating spindle or rod from the shutter release runs down inside the roller which winds up the focal plane blind, and in concentric with this and the wind-on lever. There were supposed to be benefits in longevity, smoothness of operation and most notably lower camera shake. This takes us to the end of the 1928-1958 period. 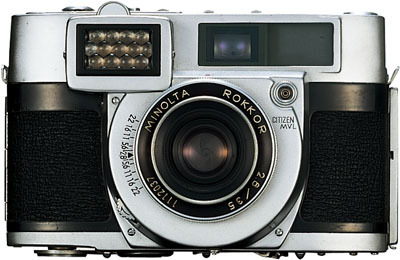 In the 1960s, Minolta moved up a gear and the variety and innovative design of their cameras will become even more apparent.